Does a UGen like Audiomulch 8x8 Matrix exist? 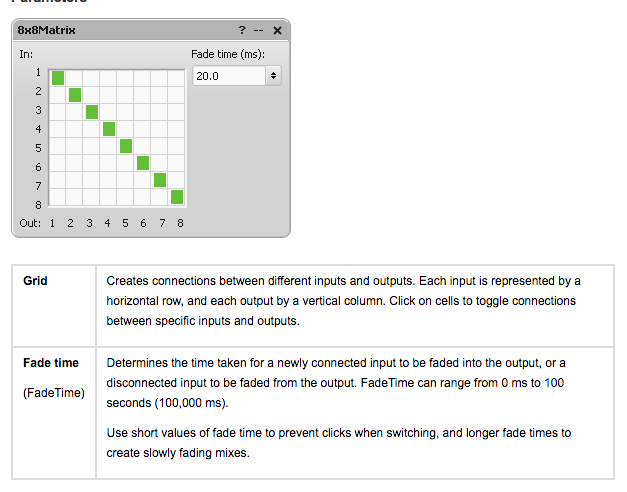 Does anyone know if there’s a UGen somewhere like Audiomulch Matrix, but with configurable n inputs and outputs ? I think it would be better to do this with multiple synths: one synth per routing. You can create and destroy the synths as needed. Great ldea ! Thanks ! I think one challenge would be the fade between arbitrary channels. With a simple lag you slide over all intermediate channels, normally not wanted. The DX ugens from miSCellaneous can do such arbitrary transitions, but: they are designed for timed channel switching. What would be needed here is a triggered DX variant. I have already thought about something like that, it would have been useful in other contexts too. At the moment I have no time to look into it, but it’s on my todo list. Thanks Daniel ! I’ll have a look at DX suite !